What better way for the No. 5 Boston University men’s hockey team to kick off 2017 than with a come-from-behind win versus a ranked opponent? It was missing seven key players due to the World Junior Championship gold medal game in Montreal, but the Terriers (11-5-2, 4-2-2 Hockey East) went out and won anyways. Sophomore forward Jakob Forsbacka Karlsson recorded his first collegiate hat trick, and BU topped No. 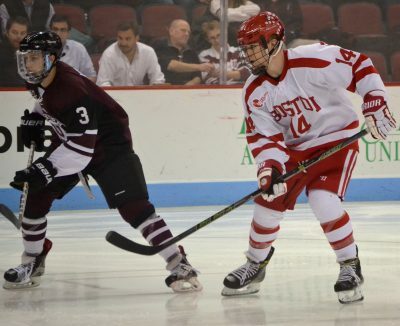 10 Union College, 5-4, in overtime at Agganis Arena on Thursday. It was a back-and-forth battle for most of the night, with the Dutchmen (14-5-2) holding a 4-3 lead with the game winding down. Yet the Terriers would get the last laugh, with Forsbacka Karlsson scoring with 2:54 left in regulation. 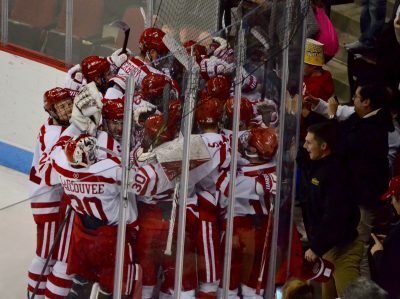 He would come through again in the overtime period to hand the Terriers arguably their biggest win of the season. Despite not having four of their top forwards, two valuable defensemen and their starting goalie, the Terriers came flying out of the gate to grab control of the game. Sophomore defenseman Shane Switzer would get the Terriers on the board on a power play three minutes into the contest. His shot from the blue line bounced off Union netminder Alex Sakellaropoulos’ shoulder and in. About six minutes later, sophomore forward Bobo Carpenter found classmate Jakob Forsbacka Karlsson on a 2-on-1 breakaway, and the assistant captain beat Sakellaropoulos glove side to extend the Terriers’ lead. Of course, the Union offense, led by the top scorer in the nation in Mike Vecchione, wouldn’t stay silent for long. The Dutchmen would score twice in a four-minute span to get right back in the game. Then, in the second period, Union’s Sebastian Vidmar scored a power play goal from the crease on an assist from Vecchione to give the Dutchmen the lead with 12 minutes to play in the second. Carpenter would respond at the 11:13 mark when miscommunication between Sakellaropoulos and a Dutchmen defender led to a loose puck by the Union net. The sophomore scored his fifth of the season to even the score once again. Yet the vaunted Union offense would strike again. Forward Brett Supinski scored from the slot on assists from Vidmar and Vecchione to regain the lead for the Dutchmen with four minutes left in the frame. Union outshot BU, 20-6, in the second period. It seemed the exhausted Terrier squad was done for, until Union shot itself in the foot late in the third period. A hooking call and a too-many-men minor gave BU a golden opportunity, and Forsbacka Karlsson delivered. His shot from the left circle hit the top right corner of the post, forcing the game into overtime. Then in overtime, it was Forsbacka Karlsson who recorded the first BU hat trick of the season 2:51 into the frame. He put in his own rebound after rushing down the right side to clinch victory. Thanks to the heroics of Forsbacka Karlsson and Carpenter, who had three points of his own, the Terriers head into Frozen Fenway on Saturday with the utmost confidence. It’s games like this that can ignite a team and ultimately change a season for the better. At least that’s how Quinn felt after the win.